Some snow appears in the offing for Thursday night and our resident chief meteorologist, Tom Novak from @MinnesotaWeather, says to keep a close eye to the near southeast over the weekend. Here's our latest video. Also, Tom and I are interested in your feedback on our video. What works for you? What doesn't? We really want you to be honest so we can make it better. Please leave your thoughts in the comment section. Thanks! Dr. Novak says to keep a watchful eye to the southeast for a storm that's yet to write off the Twin Cities. Weird, it seems to be work for me.... Others? Great vid guys may be your best yet, so yes it did work for me, you may want to use Firefox. Could be my cellphone but I couldnt get it to work for me....got to the point where Dr. Novak is sitting in front of a xmas tree but that was it.....will try the home computer....really curious on what Novak has to say because everytime I look the weekend system is moving closer and closer to affecting us,which Novak was thefirat one to point out the possibility existed....I see the NWS has 20% chance now, whereas for days their were going with nothing. @ Bigdaddy in response to your question from the previous thread. My favorite model is still the ECMWF, having said that the GGEM was rock solid about two to three days out, maybe even four with our storm earlier this month, so for that one event it had the hot hand. Now if we can go back to the last 30 days or so, maybe longer we all know its been very cold for this time of the year. Looking at the teleconnections for that time period, one would expect that the Arctic Oscillation (AO) would have been strongly negative, but in reality just the opposite has been true in that the AO has been very strongly positive, maybe even approaching record levels. So where did our cold come from? It came from a very strong negative Eastern Pacific Oscillation (EPO) which puts a very strong area of high pressure in the Gulf of Alaska. With its strong clockwise winds it dumped cold air from NW Canada down into the lower 48, while at the same time keeping Alaska on the warm side. So now lets fast forward to this weekend. The EPO is forecast to move towards neutral as this storm approaches, that means the push of cold air out of the Northwest should start to weaken in the mid levels say from 700 millibars up to 500 millibars. Now keep in mind the video above and look at the 5 minute mark and find the Left Front quad over IA and SE MN. That is the precise area that the GEM is forming a 700mb low. On the link below find the wind barbs, they are depicted by the L shape graphics. The bottom of the L shows which way the winds are blowing from. Zoom into NE Iowa and you can clearly see a counter clockwise rotation with those wind barbs, that shows where the H7 low is forecast to be at. I'm in Tom's camp on this one, at this time I think the GEM has about a 4 in 10 chance of verifying. Tom if this works out, you can use these maps in your next Vid. Love it Randy. Your thoughts dig deep & make a lot of sense. My theory is that a 700mb low should develop in the Left Front Quadrant of a jet streak that will roar north from TX to Lake MIchigan. This would place se MN, ne IA & much of western WI in the LFQ. Often, you will see a deformation band of heavy snow form in this environment especially if you can get a coupled jet structure over the same region. My fear is that we will not get a negative tilt to the trough and, in turn, we will not see a couple jet structure. If that happens, then the idea of a Major Winter Storm/Blizzard will be far fetched, even for the Midwest. 00z Euro should shed a bit more light on this. Regardless, here's looking forward to a descent snowfall tomorrow evening. I still love the upper level jet structure & I'm confident that areas near and/or north of the MSP metro will receive a quick 2"-4" blanket of white. So after combing through all the different models, they appear to really not be agreeing with each other much anymore in regards to their precip placement, low placement, etc etc. NAM came in further east than it's earlier run, but the overall look of it just doesn't seem correct. It seems too progressive with things. Then came the GFS, which actually shifted east from it's earlier runs as well. A bit frustrating for those of us who want to see a good dose of snow. GEM came in next, and that one still places snowfall over SE MN and much of Wisconsin but it came in much weaker than earlier. Now, the European model (which I think has done a better job handling our little clip of snow for Thursday) has now shifted things further WEST yet. Yes, west, as in closer to the area. In fact it shows the potential for at least advisory type snows along and east of a line from Albert Lea to Eau Claire, with the higher amounts the further southeast you go. To the northwest there is a very very sharp cutoff to the snow. More nudging to the northwest will be needed for the metro to get in on things, but I find it interesting that while the other models shifted things around a bit the Euro has moved it even closer. In my attempts to understand the upper level dynamics of storm systems I opened several tabs of the different models, looking at the 500mb and 700mb level of things between the GFS and Euro. The way I see it, they don't look any different at all initially, yet they have different outcomes. Something else that has bothered me is the fact that it really looks like the trough is starting to turn negative near the Texas Panhandle but it doesn't continue. To me, I feel like once it starts its turn it should continue. Maybe Novak can shed some light on this. I will attach an image so that you can see what I'm talking about. I think the reasoning behind the differences in track is the cold air that is supposed to come down from Canada. The GFS drops it in a little sooner and prevents the further northwest solution that the European model is showing. The Euro is slower with dropping it in, which allows the 700mb low to track from just south of Omaha, NE to Prairie Du Chien, WI to Green Bay, WI. The GFS, however, is more of a line from Kansas City, MO to Chicago, IL with that track. I, personally, am more in favor of the European models solution as opposed to the others. Maybe I just have some wishful thinking and the Euro is way off base. This could be an example of things not really clearing up until Friday when the data network has a better sampling of the trough and low that is ejecting up from the southwest. I'm bored, and pretty tired of tracking these puny little moisture starved systems. I'm glad a larger system is finally showing up and has potential, but am really trying to not set myself up for disappointment if it is a near miss to the southeast. Anyway, enough of my babbling. Novak, or really anyone that can help out...am I off base with this trough starting to tilt towards the negative and then just not doing it? Here's the images, and the area of interest. You are not off base at all, in fact, I believe your comments are right on. The negative tilt is key with this storm. If we can get it to continue the tilt process on Sunday, then much of eastern MN will be in business. I believe that this process will further help develop a deformation axis & deepen a 700mb low somewhere near LSE. Right now, the GFS/NAM don't seem to continue the deepening process of this storm & settle for a more progressive system that doesn't tilt negatively. However, last night's 00z Euro run was very interesting. It took a significant nudge NW with the storm track AND deepens the mid/upper level lows; similar to what the GEM has been advertising for several days. This makes more sense to me especially when looking at the jet dynamics AND the fact that all models place the 700mb dendrite growth zone over the se 1/4 of MN and much of IA/WI. If I were a betting man, I would put my chips down on a deepening 700mb low near LSE & a heavy snow band with near blizzard conditions from OMA to LSE to Wausau, WI. ICE storm for so. WI & eastern IA. With reports of the 12Z GFS and GGEM moving south could it be the trend is now moving this back south? SE Iowa through SE Wisconsin. The fun never ends with models! EMCWF's afternoon run should be interesting. No doubt that model data is wobbling back & forth, this is often the case with any storm evolution. The most important data piece for me continues to be the jet structure. All models are showing a jet streak from TX to Lake Michigan on SUNDAY. In theory, there should be lift in the left front quadrant of this jet streak, especially if the trough tilts negative. That would place se MN, much of WI & IA in the snow zone. Also, I am seeing faint hints of an inverted trough potential thru eastern MN & western WI. Am I drunk? It bothers me that this trough tilts negatively on Saturday as it pulls out of the southern Rockies then turns positive & progressive by Sunday. If this is indeed the case, then most of MN will miss this snow maker. Thanks for the update Dr. N. Keep them coming. Anything from the 12Z EMCWF run yet? If it takes you to get drunk to get that storm at least to RST then here's six pack. Or standing outside looking at a European model. National Weather Service is saying that dry air below 10k feet is putting the lid on snow for the Twin Cities tonight. C'mon!! It would be a bummer to be 0 for 2! By the way, Bill and Novak, I loved the video from last night. Thanks for taking the time to put it together! If only you guys could do the 6 pm news, that would be great! I would watch every night!! I need to start dancing, but I my usual optimistic attitude is turning pessimistic on me. No....I won't let it happen. I want to believe Novak and hope that Eastern MN will get in on the action, but NO ONE is mentioning it on the main outlets. That bothers me. Keep chiming in, Novak. You da man! NWS just issued its updated forecast. They have removed all mention of snow for the metro this weekend. LaCrosse NWS stated that it will issue Winter Storm Watches for southwest, southern and central WI. Not looking good for snow fans in the TC. And I just read the discussion page and they mention that a few models put MSP in a heavier snow band. They even mention a 3-5 inch total from one model. And then they forecast no mention of snow? You think they would want to be safe and predict a 30% chance or something. What am I missing??? The discussion actually says that our area will be spared and receive nothing more than high clouds and possibly some light snow from Albert Lea to Eau Claire. Eastern IA and southern WI might receive several inches of snow. The discussion further mentions RAINFALL in the amount of 3-5 inches (and possibly 6+ inches) for the area from Arkansas northeast to Ohio. Best describes our weather, aside from a few minor clippers(thank goodness we had them to avoid a brown Christmas)this seasons snowfall has been pultry, the drought observed in fall has continued on into winter. Snow tonight looks lame(amazing how all these weather people don't see dry air messing up a forecast until its virtually on top of us and this weekends storm was never a threat for MSP. Like someone said I think on a previous post wake me up when theres a real storm brewing and has its eyes squarely on us. Tom the 20/0z model runs are coming in, the GFS and Nam are not much to write home about, but the RGEM, a higher resolution model run going out only 48 looks quit interesting. It has a powerful jet streak, although I don't really know quad we would be in, but look at the base of the trough valid Sat night at 6pm central. now look at the position of the H5 low pressure over the OK panhandle and what looks to be a ridge building into the Chicago area. Notice the negative tilt with the trough. Now the H7 chart, the ridge is still there. And finally the surface chart. This looks interesting IMO your thoughts please. Thoughts are MSP will not see snow from this weekends storm! Oh I agree, but I think SE MN could still be in play. Here is what we need to happen for eastern MN to get in on the snow. 1.) The trough needs to maintain a negative tilt as it pulls NE into the Midwest. 3.) Jet streak needs to surge north from TX to IL and not progressively move east. 4.) 2nd piece of energy to our NW needs to dig a bit deeper & phase with the southern piece of energy on SUN am. 5.) Mid-Upper level low (700mb - 500mb) needs to deepen over the Upper Midwest on SUN. The comments above are a lot to expect, but it all starts with the Jet Stream. I simply don't believe that the models have a firm handle on how that river of air at 300mb (30,000 feet) is going to evolve. Where will diffluence occur, if at all? Will a coupled jet structure evolve over the Great Lakes? Where will the jet streak set-up? We should have a much better idea of how the upper level structure will evolve with today's model runs as the main trough fully pulls onto the coast of the U.S. & into the desert SW. Many more data points to measure the disturbance/trough. Right now, something smells & I feel it is foolish to simply look at model QPF & say that the storm is going to miss MN. You have to look at the mid-upper level atmospheric structure. When you do this, you will see an environment that is favorable for deepening & storm strengthening at those levels. This would equate to increased wind & snow over much of the Midwest & Great Lakes regions including portions of MN. On a side note. This storm has huge bust potential for Chicago & other areas in IL, IA that are currently in a WSW. Gut feeling is that the jet streak will pull in dry air from TX north towards Lk. Michigan. Ok, after glancing at the latest 12z NAM, it is all starting to make more sense. Here is what appears to be the NAM scenario. 1.) Lead disturbance/short wave quickly drives NE out of the southern Plains & into the Great Lakes on Saturday on the nose of a powerful jet streak. This jet streak has been advertised for days by all models. 2.) Second piece of energy digs deeper into the Plains towards the base of the main trough on SUNDAY. In turn, it strengthens = phasing as the lead shortwave dissipates over the Great Lakes. 3.) Mid-Upper level environment becomes favorable for snow over eastern MN & a good chunk of WI on Sunday as storm continues to deepen at 700mb to 300mb. In other words, I'm becoming more and more optimistic that this storm will bring accumulating snows & strong winds to eastern MN incl. MSP on Sunday. In fact, I wouldn't be surprised if northern WI gets hit hard on Sunday with significant snow & near blizzard like conditions. Don't be surprised if the NWS posts Winter Storm Watches for a good chunk of northern WI & perhaps portions of eastern MN valid for Sunday into early Monday. They will do so, esp. if the GFS & Euro show the NAM trend with their AM runs. Also, the NWS will want to see at least one more solid run of the NAM before they jump on board, so they will likely wait until late evening (00z runs) to hoist any watches. NWS is now calling for a 50% chance of snow on Sunday. The discussion this morning says that a system on Sunday and another one on Tuesday could each drop an inch or two on the metro. They aren't talking big snows, but as of last evening's forecast/discussion they weren't talking about snow at all. Here's hoping Dr. Novak is leading the charge for some nice fresh snow in time for Christmas! Novak - love it when you spill your thoughts into words for the rest of us! Thanks! Wish casting = picking the model that may give your area the best chance for snow each model run. A lot of wish casting going on on this board. You maybe right, but let us all remember that for the December 2012 storm last year ( about 9 inches) when everybody including NWS thought totals would be lowered because of warm air mixing in, Dr Novak was the only one that went with a bold prediction based on the upper level dynamics (a 700mb low) and it turned out to be true. So maybe wishful thinking, but it has some merit to it. .7 inches officially in MSP last night. Maybe closer to an inch in S. Mpls. Not much at all. Yeah that was a miss by the good Dr. Novak, before his late shift north on snow amounts MSP was squarely in his 2-4+ band.Hard to believe him on Sunday's snow because of that, but I won't discount what he's saying he definitely has weather knowledge but on the other hand the NAM is notoriously aggressive leading up to a storm then backs off last minute. Saw a report of 1.7" in NE MPLS. As usual, a sharp gradient in snowfall totals across the metro ranging from nothing in the far south to 2"+ in the far north. Many reports of 2"-4" in the STC area. Draw a line from Ortonville, to STC to Spooner, WI & that is where a 50 mile wide band of 2"-4" of snow fell. Well depicted by model data & forecasters, but off about 60 miles on the axis. Don't get me wrong, I'm happy that we have nice consistently cold air in place and we do have a few inches of snow on the ground. However, I wish this pattern would change oh so slightly. The combination of no big storms and a train of weak clippers every couple of days coming through and basically affecting the north metro up to central MN is starting to become a real bummer for this southern metro dweller. We only received a dusting last night and today. The weather service discussion this afternoon mentions more weak clippers over the next week, but again with a focus north of I-94. The larger system a couple of weeks ago highly favored the northern and northwest burbs too. I won't even go into how close we came to getting some snow from the big storm this upcoming weekend. Location, location, location...I guess. Sorry, just needed to vent to relieve the frustration. Uugghh!! I just watched the video. Waiting for the "after 9:00" report from Dr. Novak. Waiting and dancing. Waiting and dancing. Bring it, baby, bring it!! Seriously....I love these kind of surprises. Let's surprise everyone! No after 9 report because the NAM fell back in line with the rest of the models. It looks like the local outlets were right and unfortunately our Dr. Novak was not. Don't be so quick about that. My understanding is that Novak never said that the big storm to the southeast was going to shift northwest and really affect Minnesota. 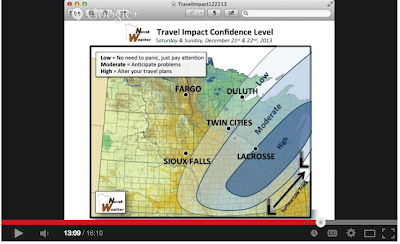 Last night in the video he was discussing that a second area of energy coming in from the northwest will give eastern MN and western WI snow, and possibly several inches, on Sunday. That is correct Sam. It has always been quite obvious that the initial surge of energy/snow would miss the MSP metro. However, the spinning mid-upper level low is what needs to be watched. The NAM continues to generate decent snow totals from MSP on east with this upper level low later SUN into MON. Combine that with some wind, and you get difficult travel conditions. Quite frankly, this storm appears to be behaving as advertised. Now we need to see if it verifies. NWS says around 1 inch for much of the metro with this storm. We'll see. There is what you want it to be, and there's what it is. Let's be honest, Novak's videos seriously imply the prospect for heavy metro snow Sunday and Monday and that all other forecast outlets are missing that. At the same time, he's not going on record with an inches forecast. No disrespect intended...but you can't have it both ways in the real world. Speculation without inches is easy. Getting on record with a forecast is different. If you're going to call other forecast outlets like NWS into question, then put your own numbers on the table. I think Novak was alerting us to the possibility that there could more snow than most other forecast outlets were forecasting, not that the Twin Cities was going to get heavy snow. Yes, he didn't provide chance of precip possibilities nor accumulation amounts, but he was introducing the possibilities. That was my take, anyway.